This species has distinctive colouration - also note the red mouthparts. 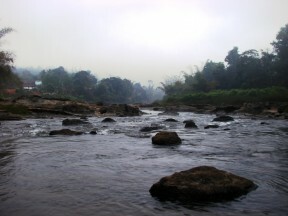 Habitat in the Bhadra River drainage. Patterning in this species can be highly variable. The following series of images serve to further exemplify these variations. Youngster - this is the most typical patterning. 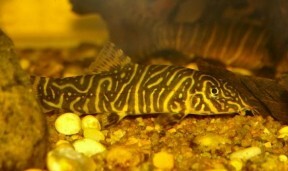 Another young fish showing wildly different markings. Yet another type of juvenile patterning. Another collection point in the Bhadra river system. This stunning wild caught adult specimen measures almost 90 mm SL. From the Latin striatus, meaning ‘striated’ or ‘striped’ in reference to this species’ colour pattern. 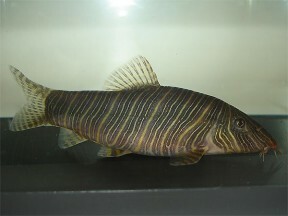 Described from the Tunga River in Karnataka (previously Mysore) state, southern India. 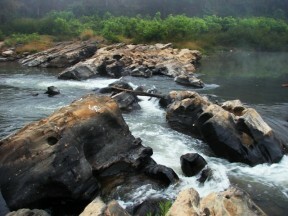 The Tunga rises in the Western Ghats mountain range and is a tributary of the Tungabhadra River, itself a tributary of the Krishna. The latter flows eastwards from Maharashtra state in the west of the country through Karnataka and Andhra Pradesh before emptying into the Bay of Bengal. B. striata has been recorded at other localities within the Krishna drainage, including the Koyna and Panchganga rivers in Maharashtra. In a survey of fish diversity in the Bhadra River (which joins the Tunga to form the Tungabhadra) it was recorded alongside numerous other species including Puntius chola, Balitora mysorensis, and Mystus armatus. Dry season water paramaters were temperature 69.8°F/21°C, pH 7.0, hardness ~ 2.5°. The substrate was composed of bedrock, boulders, cobbles, gravel, sand and leaf litter in descending order of abundance, maximum water depth was around 1.5 m and there was a degree of forest cover. 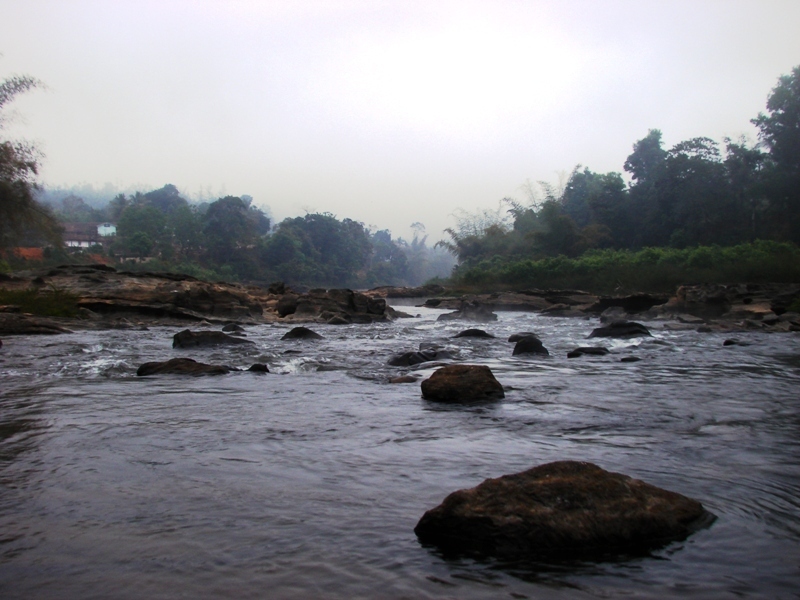 The study sampled at six sites but B. striata was found at only one of them, downstream of a dam which forms a reservoir on the river (Shahnawaz et al., 2009). Base dimensions of 120 ∗ 30 cm or equivalent should be the minimum considered. All botiids need a well-structured set-up although the actual choice of décor is more-or-less down to personal taste. A natural-style arrangement could include a substrate of sand or fine gravel with lots of smooth, water-worn rocks and pebbles plus driftwood roots and branches. Lighting can be relatively subdued and plants able to grow in such conditions like Microsorum pteropus (Java fern), Taxiphyllum barbieri (‘Java’ moss) or Anubias spp. can be added if you wish. These have an added benefit as they can be attached to pieces of décor in such a way as to provide useful shade. Bear in mind that they like to squeeze themselves into small gaps and crevices so items with sharp edges should be omitted, and any gaps or holes small enough for a fish to become trapped should be filled in with aquarium-grade silicone sealant. A tightly-fitting cover is also essential as these loaches do jump at times. Although botiids don’t require turbulent conditions they do best when the water is well-oxygenated with a degree of flow, are intolerant to accumulation of organic wastes and requires spotless water in order to thrive. For these reasons they should never be introduced to biologically immature set-ups and adapt most readily to stable, mature aquaria. In terms of maintenance weekly water changes of 30-50% tank volume should be considered routine. While Botia spp. appear to be chiefly carnivorous they will also eat vegetative matter if available, often including soft-leaved aquatic plants. The natural diet comprises aquatic molluscs, insects, worms, and other invertebrates. They’re largely unfussy feeders but must be offered a varied diet comprising quality dried products, live or frozen bloodworm, Tubifex, Artemia, etc., plus fresh fruit and vegetables such as cucumber, melon, blanched spinach, or courgette. Home-made foods using a mixture of natural ingredients and bound with gelatin are also highly recommended. Chopped earthworm can also provide a useful source of protein but should be used sparingly, and while most botiids also prey on aquatic snails though should never be considered the answer to an infestation since they’re not obligate molluscivores. Once settled into an aquarium they’re bold feeders and often rise into midwater at meal times. Peaceful but don’t keep it with much smaller fishes as they may be intimidated by its size and sometimes very active behaviour. Slow-moving, long-finned species such as ornamental bettas, guppies and many cichlids should also be avoided as trailing fins can be nipped. More suitable tankmates include peaceful, open water-dwelling cyprinids, while in larger tanks members of Barilius, Luciosoma, Balantiocheilos and Barbonymus become options. 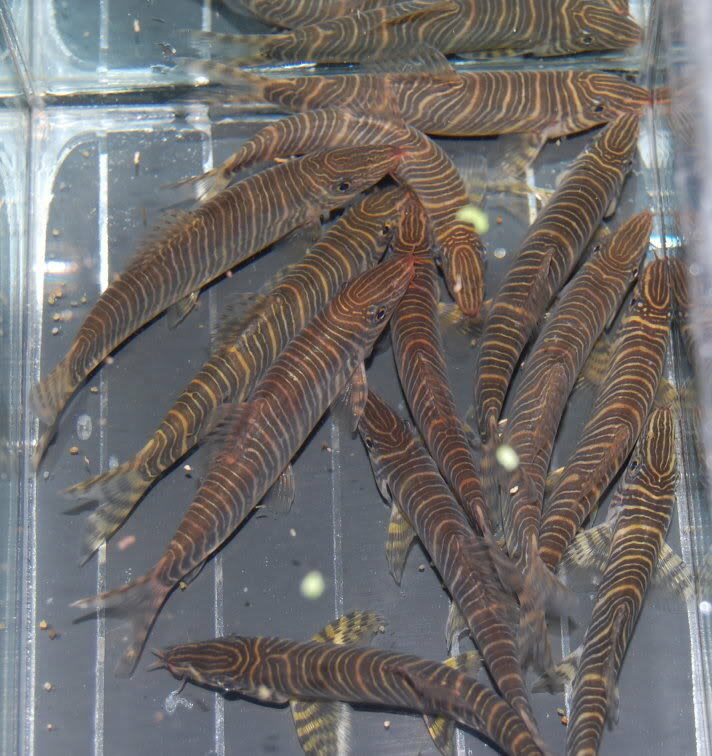 In terms of other bottom-dwellers they will do well alongside most other Botia and in very large tanks, Chromobotia macracanthus. 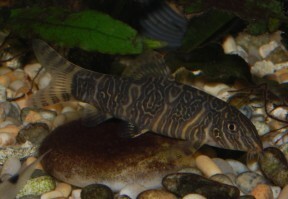 Some cobitid and nemacheilid loaches are also possibilities as are members of Epalzeorhynchos, Crossocheilus and Garra and many catfishes. As always, thorough research prior to selecting a community of fishes is the best way to avoid problems. 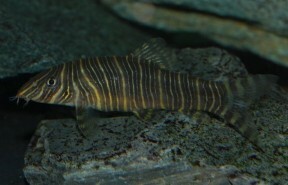 Botia spp. are gregarious, form complex social hierarchies and should be maintained in groups of at least 5 or 6 specimens, preferably 10 or more. When kept singly they can become withdrawn or aggressive towards similarly-shaped fishes, and if only a pair or trio are purchased the dominant individual may stress the other(s) to the extent that they stop feeding. That said they seemingly require regular contact with conspecifics, a fact exemplied by a number of behavioural rituals which have been recorded consistently in aquaria (see ‘Notes’). Sexually mature females are normally plumper than males and often appear to fill with eggs. 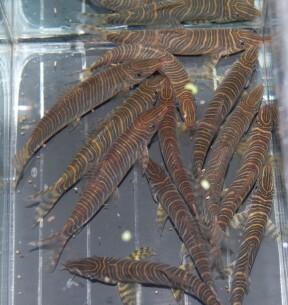 Not known to have been bred in the hobby as with the majority of botiid loaches though some, including B. striata, are being produced on a commercial basis via the use of hormones. Unfortunately this practice has been taken to a different level in recent years with a number of hybrids appearing on the market, even including an apparent cross between a form of B. histrionica and Chromobotia macracanthus. 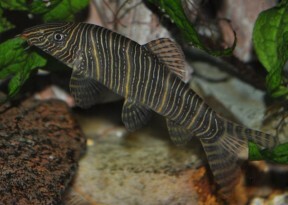 This species is perhaps the best choice of Botia sp. for the general community given its adult size and peaceable nature. Following Grant (2007) it’s included in the B. dario complex of closely-related species within the genus alongside B. striata. These are characterised by body patterning consisting of a base yellow to golden colour with 7-9 blue, green, grey or black body bars usually with thinner, lighter bars between. In some individuals the bars break up to varying degrees in a process sometimes referred to as anastomosis meaning patterning can be highly variable, and in B. striata break up entirely in some specimens. Anyway it’s one of the most easily-recognised in the genus due to its distinctive colouration and typically red mouthparts. The currently-recognised distribution of the genus Botia extends eastwards from the Indus River basin in Pakistan across northern India, then southwards through Myanmar as far as the Salween drainage (Ataran River). This range was previously much larger but modern studies have resulted in various changes to the taxonomy of both family and genus. The latter is currently defined by the following combination of characters, as given by Kottelat (2004): mental lobe developed in a barbel; fronto-parietal fontanelle narrow; anterior chamber of gas bladder almost entirely covered by bony capsule, posterior chamber large or rather reduced; anterior process of premaxilla entire, not surrounding a cavity; rostral process rather long, with a more or less distinct ridge along inner edge; top of supraethmoid narrow or broad; optic foramen very small; suborbital spine not strongly curved backwards and bifid; head naked. Some behavioural routines exhibited by Botia spp. have been recorded often enough that they’ve been assigned non-scientific terms for ease of reference. 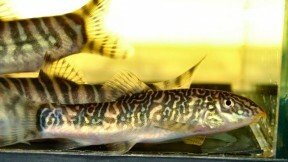 For example during dominance battles (these occur most frequently when the fish have been introduced to a new tank, or new individuals added to an existing group) the protagonists normally lose much of their body patterning and colouration, a phenomenon that’s come to be known as ‘greying out’. Such displays will sometimes also happen within an established group as individuals seek to improve social ranking but are usually nothing to worry about. 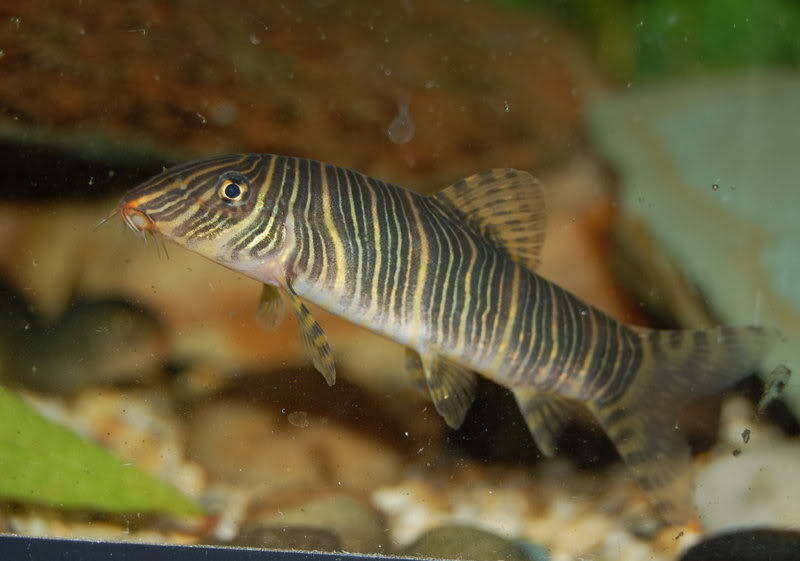 Interestingly some observations suggest that the character of the highest-ranked, or alpha, fish appears to affect that of the whole group though it must be said that scientific studies of botiid loach behaviour are virtually non-existent. It certainly seems that they display a degree of ‘personality’ with some specimens being naturally bolder or more aggressive than others, for example. The alpha is normally the largest specimen within the group and often female. ‘Shadowing’ is an interesting behaviour in which younger individuals swim flank-to-flank with older, mimicking their every movement. Some keepers report that more than one smaller fish may shadow a larger simultaneously, with even three or four on each side! The reason for it is unknown; it may relate to a group staying in touch with one another when rivers swell during times of flooding, perhaps reducing drag by swimming ‘in formation’ or having some other communicative function. It’s been observed in aquaria with both high and low water flow and seems to be habitual to the extent whereby some individuals will shadow other fishes if no conspecifics are present. 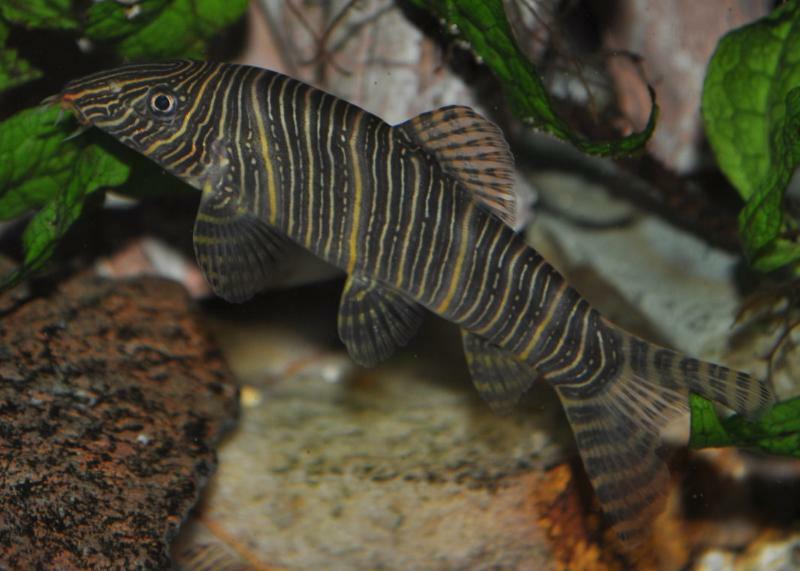 Sound also appears to be an important factor in communication since these loaches are able to produce audible clicking sounds, these increasing in volume when the fish are excited. The behavioural aspects of this phenomenon remain largely unstudied but the sounds are thought to be produced by grinding of the pharyngeal (throat) teeth or subocular spines. A further curiosity is the so-called ‘loachy dance’ which involves an entire group swimming in a constant, restless fashion around the sides of the tank, usually utilising the full length and height. The reasons for this are unknown and reports as to when it occurs vary but the most common triggers appear to be the addition of food, fresh water or new conspecifics, and it can last anything from a few minutes to a day or more. Botiids also often settle at peculiar angles, wedged vertically or sideways between items of décor, or even lying flat on the substrate. This is no cause for alarm and appears to be a natural resting behaviour. Botia spp. also possess sharp, motile, sub-ocular spines which are normally concealed within a pouch of skin but erected when an individual is stressed, e.g., if removed from the water. Care is therefore necessary as these can become entangled in aquarium nets and those of larger specimens can break human skin. Some new species of cyprinoid fish from Mysore. Fishes of the genus Botia Gray, 1831, in the Indian region (Teleostei: Botiidae). Botia kubotai, a new species of loach (Teleostei: Cobitidae) from the Ataran River basin (Myanmar), with comments on botiinae nomenclature and diagnosis of a new genus. 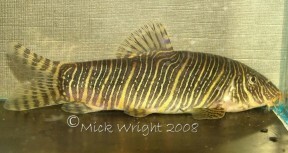 Botia udomritthiruji, a new species of botiid loach from southern Myanmar (Teleostei: Botiidae). Fish diversity with relation to water quality of Bhadra River of Western Ghats (INDIA).